Filming has begun on 'TERMINATOR: GENESIS'! Starring Arnold Schwarzenegger & Emilia Clarke! Skydance Productions have just revealed via their facebook page that production has begun on Terminator: Genesis, the reboot of the hugely successful franchise. Skydance posted the following message with the above image. Terminator: Genesis is the first in a new trilogy that stars Emilia Clarke as Sarah Connor, Arnold Schwarzenegger, Jason Clarke as John Connor, Jai Courtney as Kyle Reese, Dayo Okeniyi, Byung-hun Lee, Michael Gladis, Sandrine Holt, & J.K. Simmons. Alan Taylor is directing the movie. This movie will be the fifth instalment of the franchise. Schwarzenegger starred in all but the last incarnation, 2009’s Terminator Salvation. Terminator: Genesis has a July 1st, 2015 release date. Filming has begun in New Orleans Louisiana. The "R.I.P. 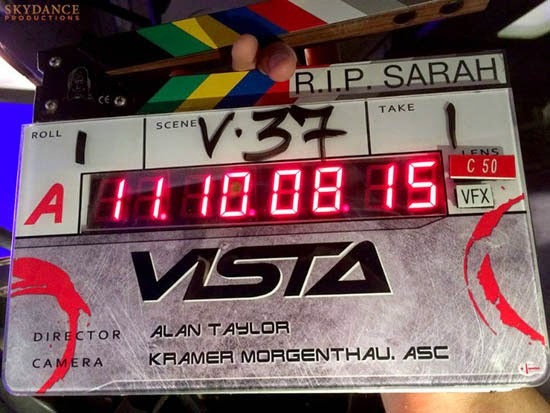 Sarah" on the clapboard is not a reference to Sarah Connor or any specific scene. It's a nice touch in memory of Sarah Jones, a crew member who tragically died while filming the Allman Brothers biopic Midnight Rider. I'm reading: Filming has begun on 'TERMINATOR: GENESIS'! Starring Arnold Schwarzenegger & Emilia Clarke!Tweet this!